At the 24-hour race on the Nürburgring, Falken Motorsports celebrated their greatest success until now with a Porsche 911 GT3 R in the Eifel. 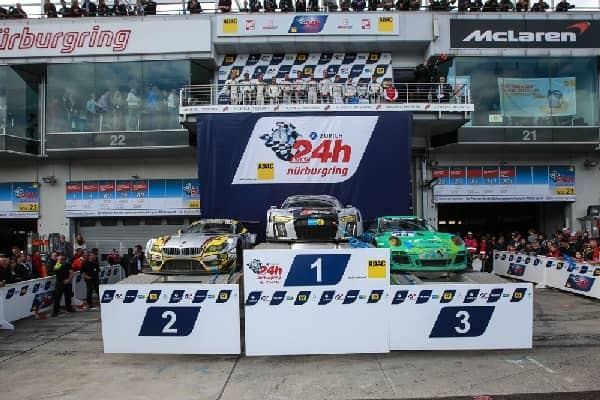 After scoring fourth last year, Porsche works driver Wolf Henzler (Germany), Martin Ragginger (Austria), Peter Dumbreck (Great Britain) and Alexandre Imperatori (Switzerland) achieved a podium result for the first time. On the 25.378 kilometre track combination, they turned a total of 156 laps in front of 200,000 spectators to cross the finish line in third place around five-and-a-half minutes behind. In the SP7 class, Porsche celebrated a triple victory. “Everyone in the team is overjoyed,” said Wolf Henzler. “Last year we finished fourth and now we’ve finally made it to the podium. Our 911 GT3 R ran like clockwork and under all conditions – rain, dry, sunshine and chilly night temperatures – its handling was excellent. We only had a slight encounter with another competitor during the night, but some tape to the front left side did the trick.” In the timing of the slow final lap, Wolf Henzler demonstrated a special knack: it took exactly 9:11 minutes. In the SP7 class, the Black Falcon team with the reigning champion of the Carrera Cup Deutschland Philipp Eng (Austria), Hannes Plesse (Germany), Manuel Metzger (Switzerland) and “Gerwin” (Netherlands) scored victory after a faultless drive in a Porsche 911 GT3 Cup. In the overall rankings they finished in 13th position with an eight-lap gap. Two Porsche ambassadors travelled to the Nürburgring for the unveiling of the new 911 GT3 R, which is based on the seventh generation of the iconic 911 sports car: Professional tennis player Angelique Kerber, currently number 11 in the world rankings, as well as world class gymnast Marcel Nguyen, the two-time silver medallist of the 2012 Olympic Games. Both enjoyed taking a look behind the scenes of the 24-hour race and the Porsche Carrera Cup Deutschland.